The word Amethyst is derived from the Greek word "amethystos" which means "remedy against drunkenness" which is reflected in the properties of this stone. 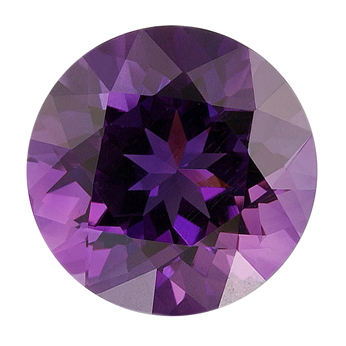 For those who were born in the month of February the Amethyst is the traditional birthstone. It is the birthstone for Aquarius. The February birthstone poem reflects some of the properties with which the Amethyst is associated - stability, peace, balance, courage, inner strength, sincerity and a calm disposition. The healing properties of the February birthstone are reputed to be effective for health problems relating to the withdrawal symptoms of any sort of addiction, headaches, insomnia, arthritis, pain relief, circulatory system issues and general healing. The Amethyst was believed by ancient Greeks and Romans to ward off the intoxicating powers of Bacchus and was said to keep the wearer clear-headed and quick-witted. The Amethyst is a member of the Quartz (silicon dioxide) family. A variety of crystallized quartz, of a purple or bluish violet colour, of different shades. It is much used as a jeweller's stone. The crystal structure of the Amethyst is hexagonal. The traditional colours associated with the Amethyst is a pale lilac to violet to red-violet colour through to a deep rich purple colour. Today, while Brazil is the primary source of this gemstone, fine material can be found elsewhere, especially in Uruguay and Zambia. Throughout history, the gemstone has been associated with many myths, legends, religions, and numerous cultures. English regalia were even decorated with amethysts during the Middle Ages to symbolize royalty. The meaning of colours through the ages represented many aspects of life - social, religious, biblical and Christian symbolism were all reflected in the colour purple. The original symbolic meaning of the colour purple was for penitence and mourning. However, it became symbolic with wealth and power and strongly associated with Royalty as the dyes used for purple materials were extremely expensive to produce. Historically, the finest amethyst were found in Russia and were featured in much royal European jewellery.